Not to be confused with United States Special Operations Command or United States Army Special Forces Command. Organize, train, educate, man, equip, fund, administer, mobilize, deploy and sustain U.S. Army special operations forces to successfully conduct worldwide special warfare operations. The arrowhead represents the Native American warrior who's fighting spirit imbues U.S. special operations forces. The dagger represents the Fairbairn–Sykes fighting knife used by the OSS of WW II fame. 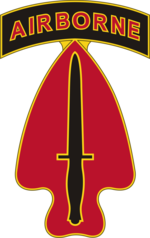 The three lightning bolts on the 1st SFC(A) CSIB represent the Special Forces' ability to strike from air, land, and sea. The United States Army Special Operations Command (Airborne) (USASOC) is the command charged with overseeing the various special operations forces of the United States Army. Headquartered at Fort Bragg, NC, it is the largest component of the United States Special Operations Command. Its mission is to organize, train, educate, man, equip, fund, administer, mobilize, deploy and sustain Army special operations forces to successfully conduct worldwide special operations. 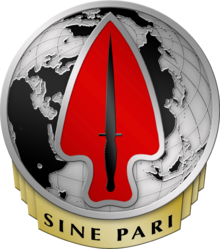 Established in 1952, the U.S. Army Special Forces Command (Airborne), also known as the Green Berets, was established as a special operations force of the United States Army tasked with five primary missions: unconventional warfare, foreign internal defense, special reconnaissance, direct action, and counter-terrorism. These missions make special forces unique in the U.S. military, because they are employed throughout the three stages of the operational continuum: peacetime, conflict and war. Today's Special Forces Groups and their unconventional warfare capabilities provide a viable military option for a variety of operational taskings that are inappropriate or infeasible for conventional forces, making it the U.S. military’s premier unconventional warfare force. Often SF units are required to perform additional, or collateral, activities outside their primary missions. These collateral activities are coalition warfare/support, combat search and rescue, security assistance, peacekeeping, humanitarian assistance, humanitarian de-mining and counter-drug operations. In 2016, the 1st Special Forces Command (Airborne) manages seven special forces groups (SFGs) (five active duty and two national guard), two Psychological Operations groups (POG), one civil affairs brigade, one sustainment brigade, and has an organic military intelligence battalion. The mission of the 4th and 8th Psychological Operations Groups (POGs) Psychological Operations (PSYOP) units is to provide fully capable strategic influence forces to Combatant Commanders, U.S. Ambassadors, and other agencies to synchronize plans and execute inform and influence activities (IIA) across the range of military operations. Psychological Operations is a part of the broad range of U.S. political, military, economic and ideological activities used by the U.S. government to secure national objectives. Used during peacetime, contingencies and declared war these activities are not forms of force, but are force multipliers that use nonviolent means in often violent environments. Persuading rather than compelling physically, they rely on logic, fear, desire or other mental factors to promote specific emotions, attitudes or behaviors. The ultimate objective of U.S. PSYOP is to convince enemy, neutral, and friendly nations and forces to take action favorable to the United States and its allies. The ranks of the PSYOP include regional experts and linguists who understand political, cultural, ethnic and religious subtleties and use persuasion to influence perceptions and encourage desired behavior. With functional experts in all aspects of tactical communications, PSYOP offers joint force commanders unmatched abilities to influence target audiences as well as strategic influence capabilities to U.S. diplomacy. In addition to supporting commanders, PSYOP units provide interagency strategic influence capabilities to other U.S. government agencies. In operations ranging from humanitarian assistance to drug interdiction, PSYOP enhances the impact of those agencies’ actions. Their activities can be used to spread information about ongoing programs and to gain support from the local populace. The 95th Civil Affairs Brigade (Airborne) enables military commanders and U.S. Ambassadors to improve relationships with various stakeholders in a local area to meet the objectives of the U.S. government. 95th Civil Affairs Brigade (Airborne) teams work with U.S. Department of State country teams, government and nongovernmental organizations at all levels and with local populations in peaceful, contingency and hostile environments. 95th Civil Affairs Brigade (Airborne) units can rapidly deploy to remote areas with small villages, as well as to larger population centers around the world. 95th Civil Affairs Brigade (Airborne) soldiers are soldiers first, but are adept at working in foreign environments and conversing in one of about 20 foreign languages with local stakeholders. Brigade teams may work for months or years in remote areas of a host nation. Their low profile and command structure allow them to solidify key relationships and processes, to address root causes of instability that adversely affect the strategic interests of the United States. The 528th Sustainment Brigade (Airborne) is responsible for providing logistical, medical and signal support for Army special operations forces worldwide in support of contingency missions and war fighting commanders. Headquartered at Fort Bragg, North Carolina, the 528th Sustainment Brigade (Airborne) sets the operational level logistics conditions to enable Army Special Operation Forces (ARSOF) operations worldwide using three ARSOF Support Operations Teams (ASPOs), three Special Operations Resuscitation Teams (SORT), five ARSOF Liaison Elements (ALE), two Medical Level II teams and 112th Special Operations Signal Battalion (Airborne). Together the units of the brigade ensure that U.S. Army Special Operations Forces are equipped to perform their missions. The brigade has the capability of providing technical control to multiple Special Forces group support battalions in the planning and execution of ARSOF combat service support and combat health support. The 528th Sustainment Brigade (Airborne) is capable of deploying three Army Support Operations Teams in support of three ARSOF-based Special Operations Task Forces or a SOF-based JTF. The Support Operations Team initially co-locates with the group support battalion or a Ranger support operations detachment and provides ARSOF with an in-theater presence providing centralized and integrated material management of property, equipment maintenance, logistical automation and repair parts and supplies. ARSOF Liaison Elements soldiers are embedded in Army regional theaters’ staff. They plan and coordinate with theater Army, Special Operations Command and Army Special Operations Command to ensure support during operations and training. As a theater Army staff member, these officers and non-commissioned officers’ knowledge of theater-specific requirements and capabilities assist units in coordination with the theater. The medical section provides Level II medical support as USASOC asset managed by the brigade surgeon and constitutes the nucleus of the capability of receiving a conventional Army Forward Surgical Team. The medical section is robust enough to provide combat health support on an area basis for approximately 450 personnel. The support includes unit-level medical support and health services, logistics, emergency medical and resuscitative treatment for all classes of patients; emergency dental treatment, physical therapy and preventive medicine support, while maintaining Standard Army Management Information Systems and providing veterinary support. Members of the 112th Special Operations Signal Battalion (Airborne) specialize in communication and force sustainment skills, employing innovative telecommunications technologies to provide Army Special Operations Task Force commanders with secure and nonsecure voice, data and video services. In their respective fields, signal and support soldiers provide oversight of material distribution management, synchronization, and integrated material management of property accountability, maintenance management and logistics automation for deployed ARSOF. Communications expertise allows ARSOF to "shoot, move and communicate" on a continuous basis. Soldiers assigned to ARSOF units are taught to operate and maintain a vast array of unique equipment not normally used by their conventional counterparts. To meet the needs of ARSOF, the Sustainment Brigade has developed logistical and signal packages that are rapidly deployable on a moment’s notice. Soldiers assigned to these units are airborne qualified. The 528th Sustainment Brigade embodies its motto of "We Support to the Utmost," providing the means to effectively and efficiently execute logistics in support of ARSOF operations. The U.S. Army Special Operations Aviation Command (USASOAC), activated on 25 March 2011, organizes, mans, trains, resources and equips Army special operations aviation units to provide responsive, special operations aviation support to Special Operations Forces (SOF) and is the USASOC aviation staff proponent. Today, USASOAC consists of five distinct units: the 160th Special Operations Aviation Regiment (Airborne), the USASOC Flight Company (UFC), the Special Operations Training Battalion (SOATB), the Technology Applications Program Office (TAPO), and the Systems Integration Management Office (SIMO). The 160th Special Operations Aviation Regiment (Airborne), newly subordinate to ARSOAC, provides aviation support to special operations forces. Known as "Night Stalkers," these soldiers are recognized for their proficiency in nighttime operations striking undetected during the hours of darkness and are recognized as the pioneers of the US Army’s nighttime flying techniques. Today, Night Stalkers continue to develop and employ new technology and tactics, techniques and procedures for the battlefield. They employ highly modified heavy assault versions of the MH-47 Chinook, medium assault and attack versions of the MH-60 Black Hawk, light assault and attack versions of the MH-6 Little Bird helicopters, and MQ-1C Gray Eagles via four battalions, an Extended-Range Multi-Purpose (ERMP) company, a headquarters company, and a training company that are spread out between Fort Campbell, Hunter Army Airfield, and Joint Base Lewis-McChord. The 75th Ranger Regiment, also known as the Rangers, is an airborne light-infantry special operations unit. The regiment is headquartered at Fort Benning, Georgia and is composed of one airborne special troops battalion (BN) and three airborne light-infantry BNs; two of those BNs (the 1st and 2nd) are stationed at Hunter Army Airfield, Georgia and Joint Base Lewis-McChord, Washington respectively. Within the US special operations community, the 75th Ranger Regiment is unique with its ability to attack heavily defended targets of interest. The regiment specializes in air assault, direct action raids, seizure of key terrain (such as airfields), destroying strategic facilities, and capturing or killing high-profile individuals. Each BN of the regiment can deploy anywhere in the world within 18 hours notice. Rangers are capable of conducting squad through regimental size operations using a variety of insertion techniques including airborne, air assault, and ground infiltration. The regiment is an all-volunteer force with an intensive screening and selection process followed by combat-focused training. Rangers are resourced to maintain exceptional proficiency, experience and readiness. The U.S. Army John F. Kennedy Special Warfare Center and School (SWCS) at Fort Bragg, North Carolina, is one of the Army's premier education institutions, managing and resourcing professional growth for soldiers in the Army's three distinct special-operations branches: Special Forces, Civil Affairs and Psychological Operations. The soldiers educated through SWCS programs are using cultural expertise and unconventional techniques to serve their country in far-flung areas across the globe. More than anything, these soldiers bring integrity, adaptability and regional expertise to their assignments. On any given day, approximately 3,100 students are enrolled in SWCS training programs. Courses range from entry-level training to advanced warfighter skills for seasoned officers and NCOs. The 1st Special Warfare Training Group (Airborne) qualifies soldiers to enter the special-operations community, and teaches them advanced tactical skills as they progress through their careers. The Joint Special Operations Medical Training Center, operating under the auspices of the Special Warfare Medical Group, is the central training facility for Department of Defense special-operations combat medics. Furthermore, SWCS leads efforts to professionalize the Army's entire special-operations force through the Special Forces Warrant Officer Institute and the David K. Thuma Noncommissioned Officer Academy. While most courses are conducted at Fort Bragg, SWCS enhances its training by maintaining facilities, and relationships with outside institutions, across the country. The 1st Special Forces Operational Detachment-Delta (1st SFOD-D), commonly referred to as Delta Force, Combat Applications Group/"CAG", "The Unit", Army Compartmented Element, or within JSOC as Task Force Green, is an elite Special Mission Unit of the United States Army, under the organization of the USASOC but is controlled by the Joint Special Operations Command (JSOC). It is used for hostage rescue and counterterrorism, as well as direct action and reconnaissance against high-value targets. 1st SFOD-D and its U.S. Navy counterpart, DEVGRU, "SEAL Team 6", perform many of the most highly complex and dangerous missions in the U.S. military. These units are also often referred to as "Tier One" and special mission units by the U.S. government. ^ a b SOCOM Fact Book 2014 (PDF). SOCOM Public Affairs. 2014. Archived from the original (PDF) on 4 December 2013. Retrieved 17 December 2015. ^ "Special Forces Shoulder Sleeve Insignia". soc.mil. Retrieved 23 March 2019. ^ a b c U.S. Army Special Forces Command. Soc.mil. Archived from the original on 20 December 2010. Retrieved 17 December 2015. ^ a b c d "MISOC Units Re-designate as PSYOP – ShadowSpear Special Operations". Shadowspear.com. 13 December 2015. Retrieved 17 December 2015. ^ a b c 95th Civil Affairs Brigade. Soc.mil. Retrieved 17 December 2015. ^ a b c d e f g 528th Sustainment Brigade. Soc.mil. Retrieved 17 December 2015. ^ Jamie Riesberg (2009). "The Special Operations Resuscitation Team: Robust Role II Medical Support for Today's SOF Environment" (PDF). Journal of Special Operations Medicine. 9. Retrieved 26 January 2014. ^ "Night Stalkers mark new lineage with donning of USASOAC patch | Article | The United States Army". Army.mil. 3 October 2013. Retrieved 17 December 2015. ^ a b About SWCS. Soc.mil. Retrieved 17 December 2015. ^ Naylor, Sean. Relentless Strike. Chapter 4. ^ "Peter Jan Schoomaker". History.army.mil. Retrieved 17 December 2015. Wikimedia Commons has media related to United States Army Special Operations Command. This page was last edited on 23 March 2019, at 16:48 (UTC).